This is the perfect salad for summer and is one of my all time favorite salads, I never get tired of making it. This recipe is very simple, but peeling and grilling the zucchini ribbons could be time consuming if you make for a party. I just made it yesterday for dinner for 2 people, it only took me 20 minutes. 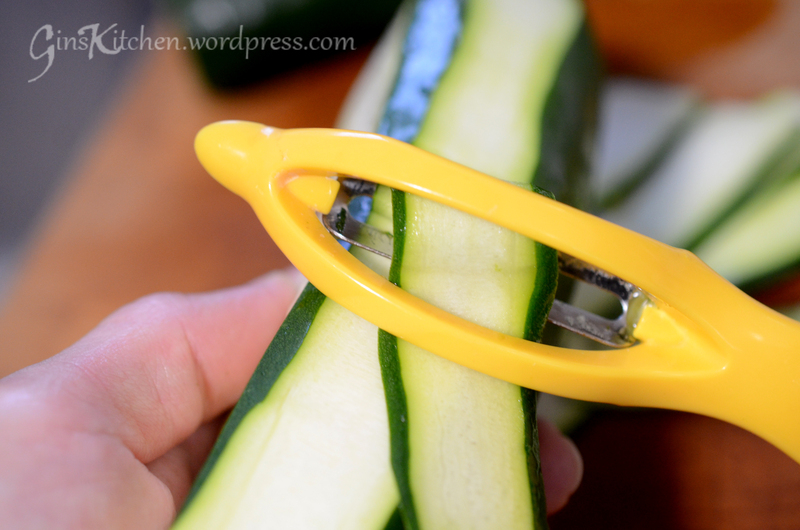 Cut off the ends of the zucchini, then use a vegetable peeler to slice the zucchini into thin ribbons. Peel down four sides until you hit the seeds. Heat a cast iron pan (on stove top) or an outdoor grill over medium high, lightly coat with olive oil. Line zucchini ribbons on the grill pan and grill for about 30 seconds and turn. Make sure they cool completely before adding them to your salad. 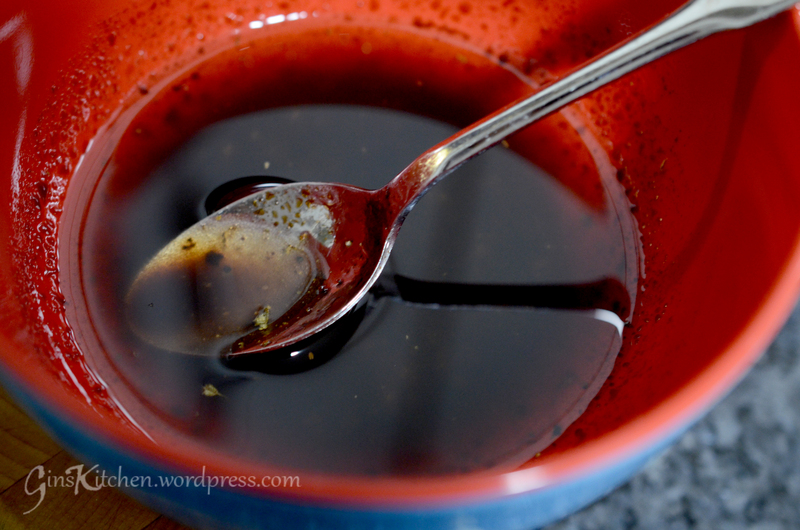 In a small bowl, whisk olive oil, balsamic vinegar, red rice vinegar, dried oregano, salt and pepper. 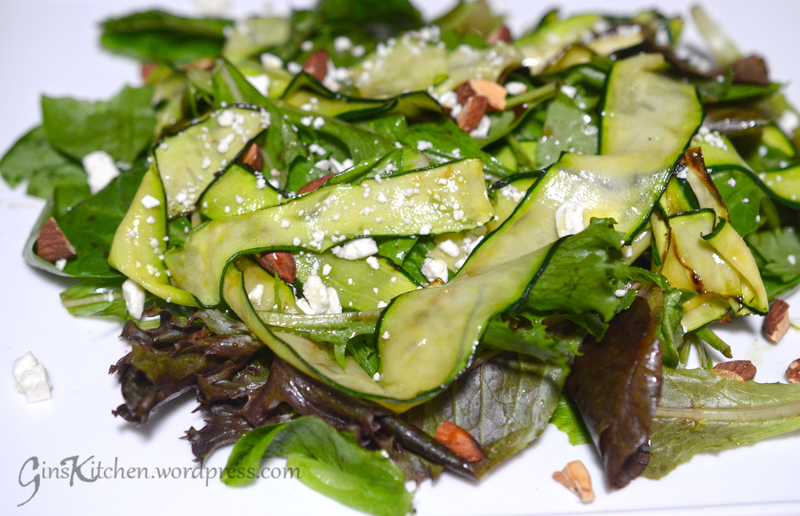 Toss zucchini and spring mix with the dressing, sprinkle with roasted almonds and feta cheese. Serve immediately. 1. If you don’t have a grill, make sure to use a cast iron pan. It will enhance the flavor. 2. You can use the remaining parts of the zucchini for another dish. Whenever we visit a Chinese dumpling restaurant, we always order green onion pancakes. When served hot, these flaky and savory pancakes are crispy outside, and chewy and soft inside. Many people like them, even though they are not fond of green onions. Most restaurants make good scallion pancakes, but occasionally we had some doughy and thick ones which my kids didn’t even touch. 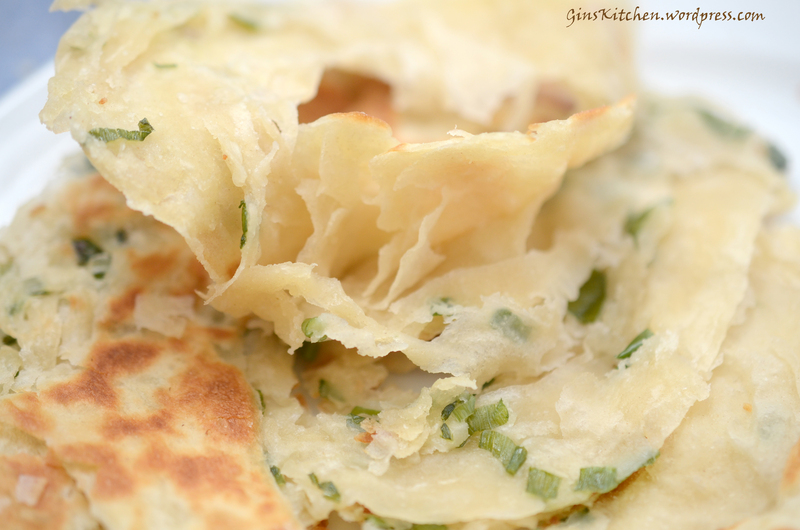 If you never tried Green Onion Pancakes, just remember they are not pancakes at all as they are not made out of a batter. 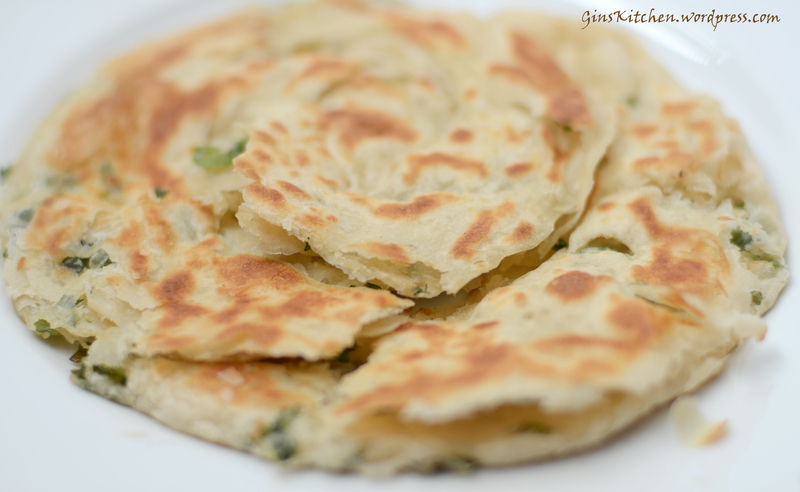 They are more like crispy, multi-layered flat bread filled with green onions. * I used milligram (ML), it’s more accurate as 1/4 cup is about 60 ml, then the water amount is a little too much. Repeat steps 6-12 for the rest of the dough. Scrunch up the pancake a little bit by using serving tongs or two wooden spoons/turners. (Picture C). Serve immediately. See how flaky the pancake is. It’s crispy outside and soft inside. It was Super Bowl night. Super Bowl Sunday still holds the record for most pizza delivered in a single day. Studies showed that 1.25 billion chicken wings would be consumed and 29 million slices were projected to sell on Super Bowl Sunday. I’m not surprised as almost 95% of Americans planned to watch the Super Bowl. Today, I joined the party (not to watch the game but make my own pizza)! 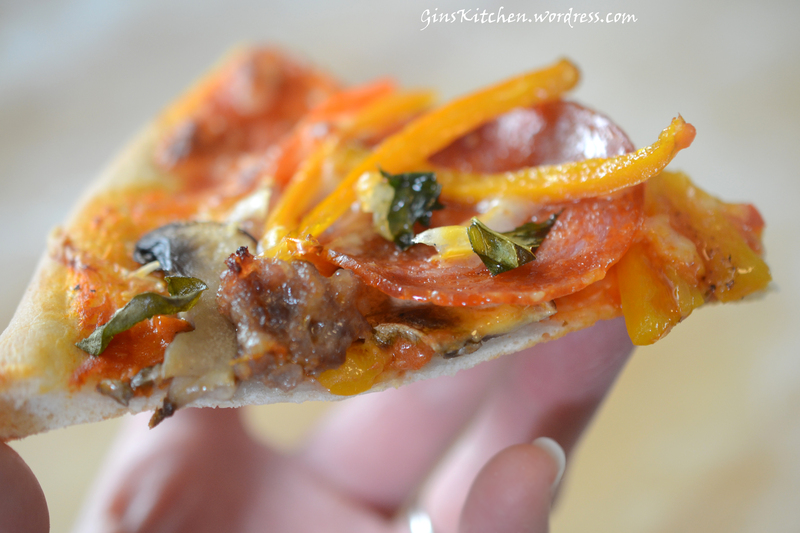 The pizza dough and pizza sauce were made from scratch. The sauce recipe was adapted from KitchenTreaty and was made with fresh tomatoes. I can taste its freshness. Dice tomatoes and set aside (picture 1). In a medium sauce pan, heat oil over medium high heat. Add minced garlic and cook until aromatic. Add tomatoes, dried oregano, sugar, salt and black pepper. Keep stirring (picture 2). Leave over medium heat, stir occasionally, until boiling. Reduce heat to low and simmer UNCOVERED for 45 minutes or until sauce is thickened (picture 3). 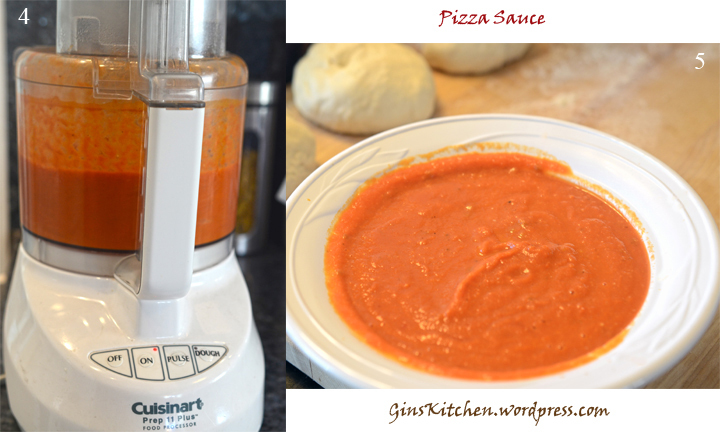 Allow the sauce to cool and blend the sauce in a food processer (picture 4). Pour sauce into a bowl and let it cool (picture 5). Place all ingredients (except dry yeast) inside the pan in the breadmaker. Fill the yeast dispenser with dry yeast (usually it is on the top of the breadmaker). Select the “Pizza dough” mode (refer to manual of your breadmaker to select the dough program). After the kneading process, allow the dough to rise in the breadmaker for about 1 1/2 – 2 hours. 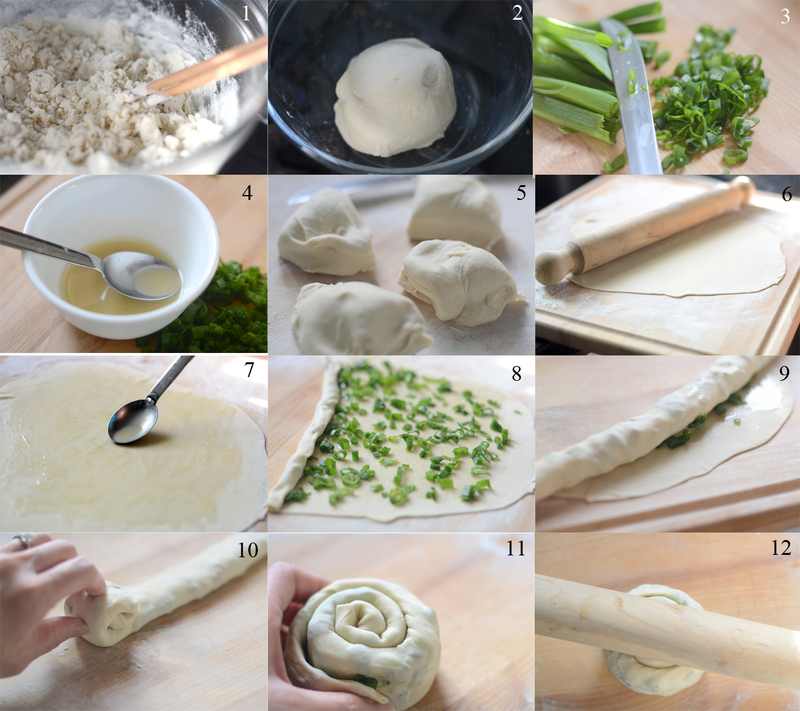 Deflate the dough, bunch it back and divide it into 5 pieces – You can use the dough at this point, but for a finer and nicer texture, after deflating and punching the dough, roll it into a ball and put it back into an airtight container and refrigerate overnight. About 2 hours before you are going to make your pizza, remove the dough from the fridge, deflate again, and split into 5 equal portions. Roll each portion into a ball and cover with plastic wrap. Let them sit at room temperature for 2 hours. ** I made my pizzas with the above ingredients, of course you can add anything you want to your pizza, such as ham, BBQ chicken, even Kimchi. Now warm 1 tablespoon oil. Add the mushrooms, salt and pepper and cook (stirring occasionally) until softened. Transfer the mushrooms to the plate with the peppers and onion. Preheat oven to 500 ºF and heat up the baking stone (or baking pan) in the oven. For the longest time, I thought potato au gratin and scalloped potatoes were the same thing. 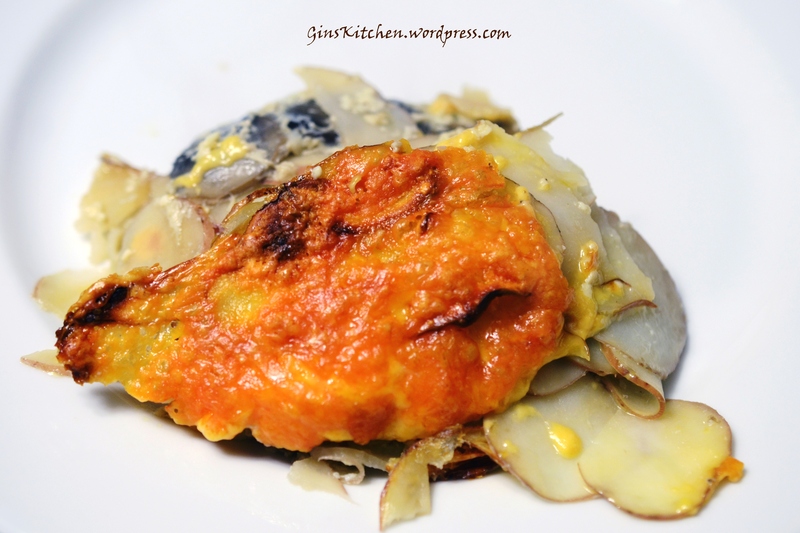 I was told they were slightly different – gratin is baked with a layer of cheese (or breadcrumbs) on top until it turns golden brown, while scalloped potatoes never includes cheese. Both dishes are equally yummy! This side dish is very easy to make, it may take some time to thinly slice the potatoes, but after putting the dish into the oven, you are completely done! I put cheddar cheese on top since my kids like cheddar, but you can use any cheese you want. Preheat oven to 400F, rub an oven-proof dish with butter and garlic. Thinly slice the potatoes (picture 1). 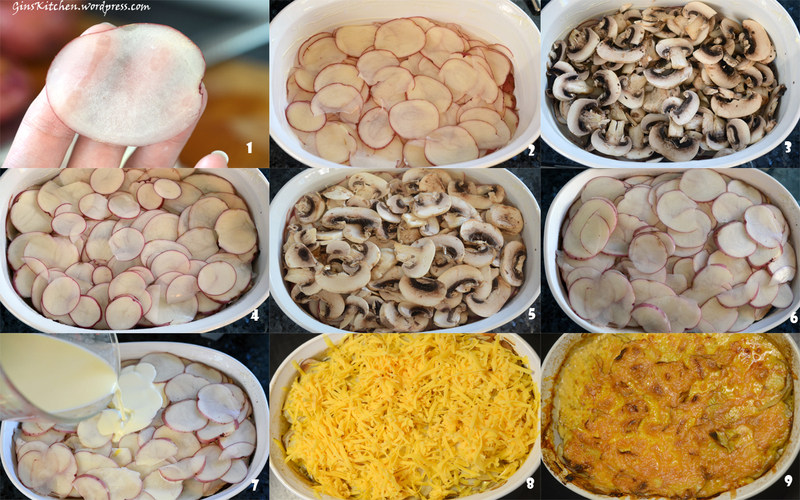 Start with a layer of potatoes on the bottom of your dish (picture 2), then add a layer of sliced mushrooms (picture 3). Sprinkle salt and pepper, then repeat steps 2 and 3 to add another layer of potatoes and mushrooms (pictures 4 and 5). After seasoning with salt and pepper, top with remaining potatoes (picture 6). Mix together eggs, milk and cream and pour over vegetables (picture 7). Bake for an hour. Remove the dish from oven and sprinkle cheese over top (picture 8). Bake 25 minutes or until cheese is melted and golden and vegetables are tender (picture 9).